In "Can technology help promote equality of educational opportunities?" Brian Jacob and coauthors, including Ford School alumna Susanna Loeb (MPP '94), explore the promise and limitations of "next generation" educational technologies like virtual schooling, intelligent tutoring, and blended learning. The researchers find many benefits to these new technologies: "Unlike teachers, technologies have no preferences for the schools in which they work," they write. "As such, technologies [have the potential to] reduce inequalities in resources across schools." 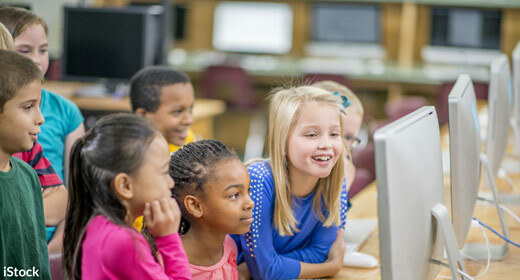 Ultimately, however, the researchers conclude that the evidence to date suggests that technologies alone cannot eliminate the significant achievement gaps prevalent in schools across the nation. » Read "Can technology help promote equality of educational opportunities?" in the Journal of the Social Sciences. Over the last 40 years, more and more moms have stepped into the workforce. Today, about 70 percent of moms work 'outside the home.' But surprisingly little is known about the labor force trajectories of these mothers: When we follow the same mothers over time, what do their patterns of employment look like? And are these patterns in any way connected to a mother's level of education? Using longitudinal data from the Fragile Families and Child Wellbeing Study, Natasha Pilkauskas and coauthors found that the least educated moms—those who had never earned a high school degree—had a much tougher time in the labor force. While moms with more education tended to increase their labor force participation as their children aged, the significant labor force challenges faced by moms without a high school degree—including unemployment, underemployment, and stepping out of the labor force entirely—persisted over the decade-long study. » Read "Maternal labor force participation and differences by education in an urban birth cohort study" in Demographic Research. Do better school facilities make better students? It's a question that education policy leaders have debated for many years—and for good reason. Some state and local governments make enormous investments, funded through voter-approved bonds, to build and repair public school facilities; other community schools, particularly those in disadvantaged neighborhoods, remain in a constant state of disrepair. Kevin Stange and colleagues, including former Ford School research scientist Isaac Mcfarlin Jr, explore the effects of nearly 1,400 capital campaigns initiated and financed by hundreds of local school districts across the state of Texas. Comparing districts where bond referenda narrowly passed to those where similar bond referenda narrowly failed, they examine student outcomes in the years before and after the improvements. Their finding: That there is little evidence to indicate that school facility upgrades improve student outcomes or reduce achievement gaps. Far more effective, they note, are operational investments that reduce class sizes or improve a school's instructional capacity. » Read "Investing in schools: Capital spending, facility conditions, and student achievement" in the Journal of Public Economics. Using charter school admissions lotteries, which randomly identify students to attend oversubscribed charters across the nation, Susan Dynarski and coauthors are able to estimate the effects of a charter school education. Focusing their analysis on charter high schools in the City of Boston, the researchers compared the outcomes of those who won the lottery to those who lost. The researchers found that those who studied at Boston's charters experienced many positive effects. They were more likely to pass the state's rigorous high school exit exam, more likely to qualify for a statesponsored scholarship, more likely to fare well on the SAT, more likely to take and pass AP exams, and more likely to enroll in a four-year degree program. » Read "Stand and deliver: Effects of Boston's charter high schools on college preparation, entry, and choice" in the Journal of Labor Economics. Susan Dynarski notes that while Boston's charter high schools appear to produce many positive effects for students, not all charters have the same success rates. She and her colleagues, including Brian Jacob, will soon release an analysis of the effects of Michigan charters. Read more about these "faculty findings," and many others, at fordschool.umich.edu/faculty-publications.